Replacement parts for many older PHI / PerkinElmer Auger, XPS, and SIMS systems. 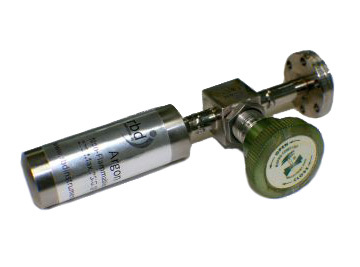 Customer's anode is subject to inspection by RBD Instruments before it can qualify as an exchange. RBD Instruments provides a re-fill service for Argon, Oxygenm and Xenon / 25cc and 50cc gas bottles used on PHI 04-3030 and 06-350 ion sources. Our refill service costs a small fraction of what a new bottle costs. Important: When returning an empty bottle to RBD to be refilled, the valve must be left in the open position. If the valve isn't left open, fees and penalties may be incurred. Any and all such fees will be charged back to the company that shipped the bottle to RBD. International Customers: 25cc bottles cannot be shipped to locations outside of the USA. If you have a 25cc bottle you would like to refill, you may send it to RBD for a credit towards the purchase of a 50cc bottle.